NASA’s Sun-observing spacecraft produce some pretty breathtaking images of our star — everything from detailed closeups of its surface, to wide-field views of its expansive outer atmosphere. But on occasion, the acrobatics of light that can produce some odd photographic effects. Here are some of the more common imaging anomalies and explanations for why they occur. Coronagraphs are designed to image the Sun’s corona, or outer atmosphere — but occasionally, other astronomical objects sneak into the picture. When they do, they can produce some strange image artifacts. In some cases, the artifact is due to the instrument itself getting in the way. For example, note the “butterfly” shape of Venus in the STEREO coronagraph (COR2) image below at the 10 o’clock position. That’s caused by diffraction, or bending, of Venus’s light off of the occulter stem — the strip of material, too out-of-focus to be seen in this image, that holds the dark disc in the center to block the bright Sun. In other cases, the astronomical objects are just too bright, saturating the instrument’s sensitive detectors and leaving vertical or horizontal streaks of light across the image. 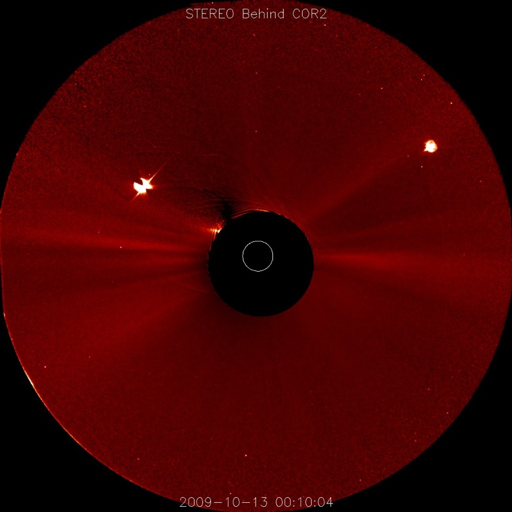 For example, consider this video from the SOHO spacecraft, compiled from data taken Jan. 2-4, 2010. As a Sun-grazing comet streams across the sky, Venus is visible just to the lower right of the Sun. Notice how the planet’s light smears out to both sides — that’s the “bleeding” of the excess signal along the detector’s columns. Often the heads of bright comets will show the same aberration. (The attentive observer will notice Mars, a small dot of in the upper left, moving left to right). In a different scenario, NASA’s Solar Dynamics Observatory captured this X7 (major) solar flare erupting on Aug. 9, 2011, shown here in extreme ultraviolet light. 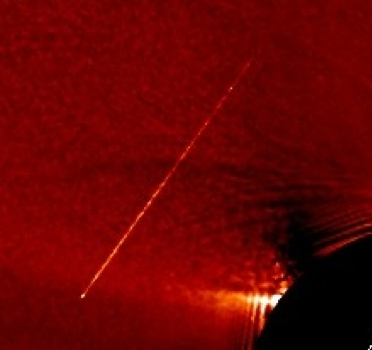 The flare caused very bright saturation and “blooming” artifacts above and below the flare region, causing extended diffraction patterns to spread out in an “X” formation across the SDO imager. As a final example, we look at highly energetic particles that travel through space. 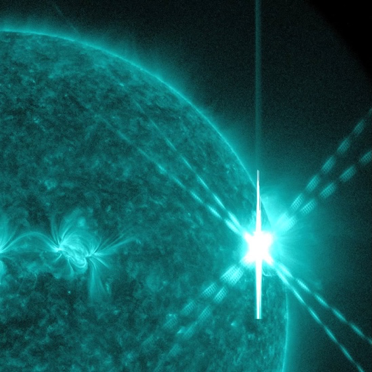 Some of these, known as solar energetic particles, originate from the Sun, while others, known as galactic cosmic rays, come from outside the solar system. When they pass through the detectors, they can produce thin bright bands or streaks of light. This one was observed by a STEREO coronagraph. Although they may seem pesky, these artifacts and anomalies are normal, expected results from properly functioning spacecraft. But they remind us that images, like any other form of data, don’t speak for themselves: what we see is a product both of nature and the instruments we use to observe it.